Jo Anne’s Place Health Foods was a GPA EDC EPIC Ventures Winner, and its Senior Manager Paul Hudson was pleasantly surprised with being rewarded it. "It's wonderful to be chosen" says Hudson, adding "It's like a pat on the back that you don't always expect." Always striving to provide better customer service and helping out any customer that may have a question has always been their goal. The team is proud of their Water Street location (right on the Rotary Greenway trail), and with its easy access, they knew that when they opened the larger store on Lansdowne that both locations would be viable—and it would help Jo Anne's serve their customers better. Paul Hudson says they were "forced" to open a second location because their Water Street store could not handle the growth of both patrons and new products. They felt their customer service was suffering and there were issues with managing stock between their Peterborough and Lindsay stores. The new location took two years to find and once they had decided on the best location, it took an additional year before they were ready to open the doors. It now plays the role of their head office and facilitates all product shipments and in turn sends product to both the Water Street and Lindsay stores. "We're bringing in new product all of the time," says Hudson. August and September are their busiest months with back to school, then in October and November they start planning on what products to carry for the next year. Gluten Free, Dairy Free, Vegan and Celiac friendly food are all carried by Jo Anne's. They also have a clean-room where they bag their own goods. Things like nuts and seeds are refrigerated to keep their freshness at this one-stop shopping destination. Paul is proud of the amount of space the new store provides. There is ample room to display the store stock and they even have areas for product displays, product education, seminars and items on sale. He also feels that their stores offer some of the best pricing between Ottawa and Toronto because of their location here in Peterborough. "Peterborough is a great area. I was born and raised here. It has a good vibe." Jo Anne's is a family business. Jo Anne herself (who started the business back in 1976) is currently retired, but still attends the annual meetings and comes in each week to do her shopping. 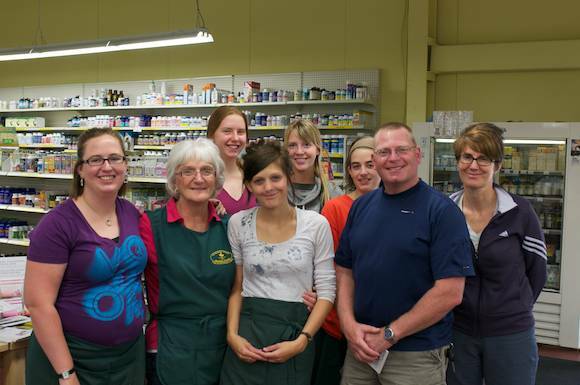 Jo Anne's Health Foods currently employs around 45 people between all of the stores. Jo Anne's is at 904 Water Street and 1260 Lansdowne Street West here in Peterborough. Don't forget to stop in on the first Tuesday of every month for Customer Appreciation day and receive 10% off your entire purchase. You can follow them on Twitter, Facebook and read more about the products they carry on their website.